Some parts of the forests in Southeast Alaska are a little off color. Hemlock trees are turning yellow and brown from a sawfly outbreak. But scientists say there’s not much to worry about. 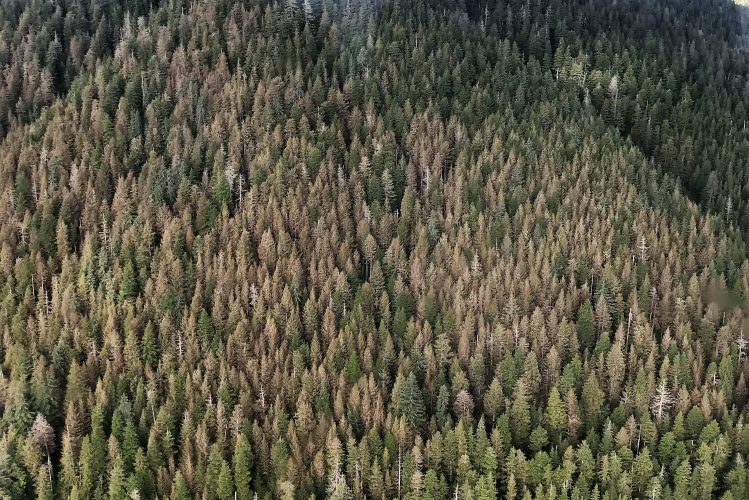 The U.S. Forest Service started getting a lot of calls this month about yellowish trees on hillsides in Southeast Alaska. The color is from dying hemlock leaves, which were damaged by an insect. So, they got their experts to look into it. Elizabeth Graham is an entomologist who works with the Forest Service in Juneau in a division called Forest Health Protection. 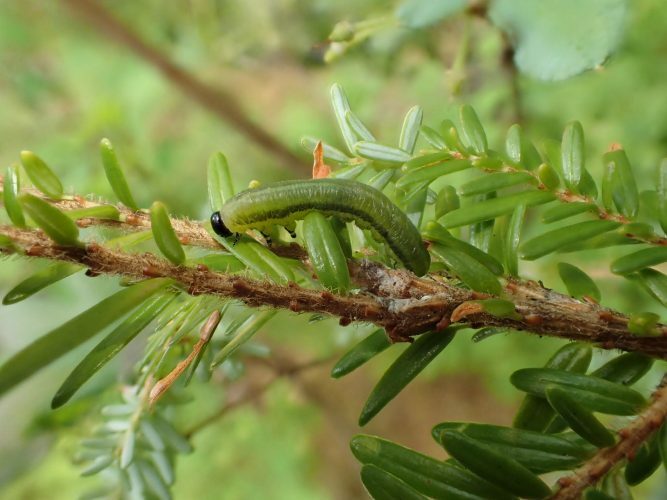 The sawfly’s larvae — which look like tiny green caterpillars — are feasting on hemlock leaves as part of their short life cycle. They gorge on leaves just before creating their cocoons. As they eat, the leaves turn yellow and fall off. The feeding frenzy damages the trees but it doesn’t kill them. The sawflies only eat old needles leaving new growth alone. Graham and other scientists have flown aerial surveys and taken samples on several islands — Mitkof, Kupreanof, Prince of Wales and Admiralty. They did see a sawfly infestation. But they’re not that concerned. The main reason is sawflies are native to the region. They’re part of the normal ecosystem, which means other species keep the sawfly populations in check. One is fungi, which infect the larvae but this summer’s hot, dry weather hasn’t been a good year for them so sawflies have flourished. Another natural sawfly control comes later in the cycle and that’s the parasitoid wasps. “Which are really, really cool. They actually lay their eggs inside these pupal cases and so the parasitoid wasp is feeding on the pupae inside the case and then they will eventually burst out of the case, sort of like an alien,” Graham said, laughing. Graham hopes some of those alien wasps will emerge from the sawfly cocoons soon. She’s collected several of the cases to take back to her lab to observe. Another insect can pair up with the sawfly to cause problems: the western black-headed budworm, which eats the trees’ new growth. An outbreak at the same time as the sawfly can actually kill the trees. But scientists haven’t seen that this year. It would take a few years in a row of the sawfly’s population to go unchecked for there to be a cause for concern. And the bugs do play an important role in the forest. This fall, the sawfly pupae will emerge from their brown cases as tiny wasps, but not the kind that sting. They’ll mate up, then lay eggs, which overwinter and hatch in the springtime. Graham and her colleagues will continue to monitor them.